I really wanted to do a ramen topping with pork based on one of my favourite Chinese dishes, twice cooked pork. This dish is so-called because you first boil and then fry the pork in a sauce, creating a crispy, tasty dish with a really oriental, umami flavour. You could add more vegetables to this and increase the quantities, serving with rice for a main meal rather than as a topping. I have used some Japanese ingredients for this dish, but have included sweet bean paste, which gives it a distinctly Chinese flavour. 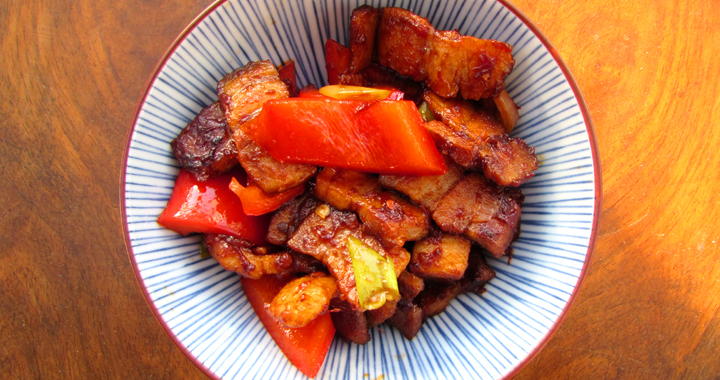 If you have never cooked pork belly as a stir fry before, this is a revelation and the boiling really changes the texture- for the better! Please note: sweet bean paste is found in Chinese supermarkets under several different names: sweet fermented sauce, sweet bean paste, hoisin sauce. It is different to hoisin sauce that you serve with duck and usually comes in little sachets. If you struggle to find it, substitute 1 tsp tomato ketchup and a dash of Worcestershire sauce for tang. Variation: My husband avoids eating pork, so for him I used a chicken breast quarter on the bone, which I oven cooked and then fried the stripped meat in the same way, but fried the sauce ingredients, pepper and onions first and then added the chicken. I also used the leftover bones to make chicken stock for my broth. Put the pork belly in a saucepan and cover with cold water. Bring to the boil and then put the lid on and turn down to a simmer for fifteen minutes. Drain the pork (retaining the liquid for adding to your ramen broth) and allow to cool. Put the pork in a dish and refrigerate for several hours until chilled and firm. Remove the pork from the fridge and slice thinly into bite sized pieces. If you are using pork belly slices, just slice along the width of the pieces. If you are using one large piece, first cut into strips and then slice. Heat the oil in a wok or frying pan on a high heat. Add the pork once the oil is hot and fry until it just starts to colour and crispen up. Add the chilli bean sauce, sweet bean paste and soy sauce to the wok and stir fry until the pork is well coated and the pan aromatic. Add the pepper and onions to the wok and continue to cook until the pepper is slightly softened, but still has a little bite. Serve, or keep warm until the rest of your ramen is ready to serve- I find it doesn’t lose its crispiness if you do this! Posted in Main Dishes, Recipes, Toppings and tagged Chilli, Laoganma, Pork, Toppings.